Destiny PS4 video. Gameplay with Keyboard and Mouse. Destiny PS4 footage. Gameplay with Keyboard and Mouse. Preliminary mouse settings and testing, easy aim for headshots. Made possible with Titan One device and MaxAim DI. Is Using a Keyboard and Mouse on a Console Cheating? 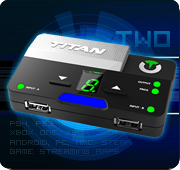 by Josh Engen from GeekParty.com – Thank you very much Josh for sharing your thoughts about Titan One and your game play experience with it! “ I’ve never been particularly good with a control pad, but it’s not for lack of trying. These days I spend far more time twiddling thumbsticks than crunching keys. But my formative years were spent behind the keyboard and mouse, and my brain never really made the transition. Old dogs and new tricks, I guess. 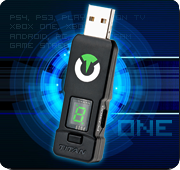 But for the last two weeks, I’ve been playing around with an impressive little device called the Titan One. It’s primarily designed to provide cross-compatibility for control pads. So, for example, you could use a DualShock 4 on an Xbox One or a Wiimote on a PlayStation 3. Nearly every popular control pad/console combination is supported, including the keyboard and mouse, which instantly felt like cheating. On a control pad, my Titanfall scores are unimpressive. I typically land somewhere in the middle of the pack with a kill-to-death ratio that hovers around 1:1. But with a keyboard and mouse under my fingers, my Xbox One is transformed into a killing machine. Headshots come easy, and my ratio climbs into the double digits.